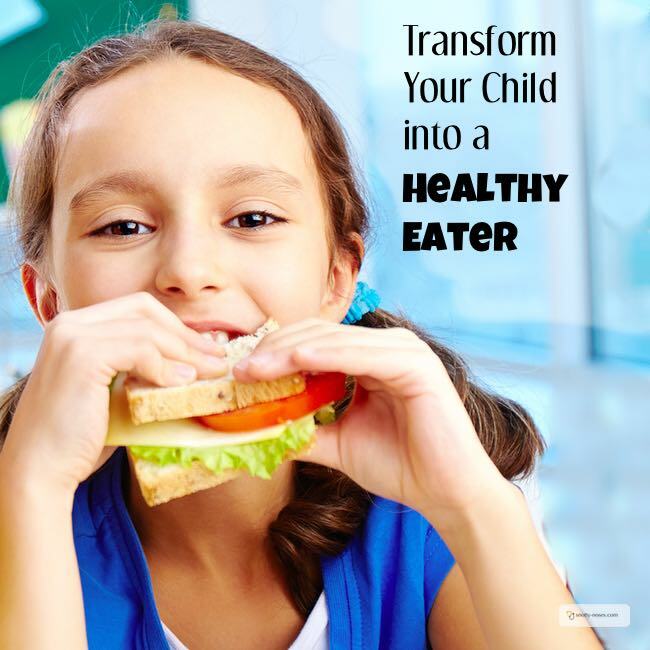 Transform Your Child into a Healthy Eater. Most children are not naturally healthy eaters. My kids would be happy to live off ham burgers and cake but I want them to grow up to love healthy food and to pick healthy options by themselves. Healthy eating is a marathon, not a sprint. So if your kids are picky eaters, or fussy toddlers and prefer junk to veggies, you have time to teach them healthy eating habits. Healthy eating is not just about "eating this one thing" or "never eating this thing". Healthy eating is what we eat (and the proportions we eat them in). Healthy eating is how much we eat (less of those giant portions of desert). It can be so confusing with so much advice on the internet. This is the basic healthy diet that you are aiming to feed your children. More fruit and vegetables. There are different ways of trying to work out how much fruit and veg we need, but I like the American MyPlate. It’s very visual and easy to understand. They recommend that half of what we eat should be fruit and vegetables…with a little bit more vegetables than fruit. The other half should be made up of grains and protein…with a bit more grains than protein. (That’s essentially our carbohydrates.) They also recommend that half of the grains should be whole grains…that’s ‘brown’ to you and me (brown rice, brown pasta, brown bread). Don’t over do the red meat and processed meats. My kids love ham and meat. But eating lots of red meat isn’t a great habit to get into. In the long term, it can contribute to your general cancer risk. I try not to let them eat too much. More fish! I aim for 2 portions of fish a week, one of which is oily. Sometimes we manage, other times we don’t. But we’re getting better. A bit of dairy, which can come in any form, so if your kids don’t like milk, they can have yoghurt or cheese. But if your kid is a milk drinker, it’s a good idea to stick to 2-3 cups of dairy (depending on age). Less proceeded food…packed full of salt, sugar and fat! Not a great habit to get into but clearly we have some packaged food. I try to choose the best of the worst and have the worst of the worst as a treat. Have a look at the labels if you aren’t sure which is which…generally the less ingredients the better. Drink mostly water. Even fruit juice is a treat, it contains lots of sugar and acid and isn’t great for your teeth. Think about portion sizes…especially of pudding! Variety! Kids love routine and would happily eat the same thing over and over again (or at least, mine would). But variety is a great way to get different vitamins and minerals from different sources. Also the more variety they have, the more likely they are to try new things. Healthy snacks! Sometimes this can be really hard but often we have fruit and yoghurt. Dried fruit, nuts and seeds are another great snack food. I nearly forgot to say...Nothing is forbidden in moderation!...sweets, candy, puddings, ice cream, soda...all allowed, as long as it's in moderation. What about My Picky Eater? Remember your long term goals to grow a healthy eater. Take baby steps and enjoy it!